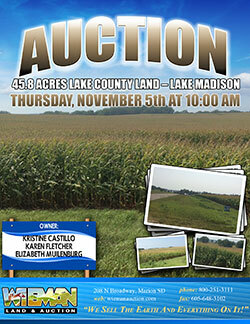 In order to settle the Lea Guthmiller estate, we will offer the following land at auction. 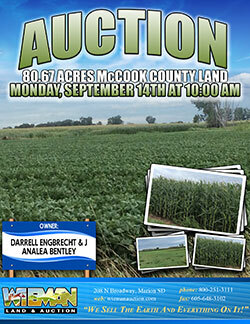 The auction to be held at Minerva’s Convention Center in the Kelly Inn at 1607 E Highway 50 in Yankton SD. We will offer the following land at auction, the auction to be held at the Wieman Auction Facility at 44628 SD Hwy 44 Marion SD. 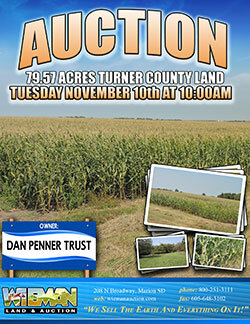 We will offer the following land at auction for the Donald C. Peterson and Bonnevieve E. Peterson Family Living Trust at the Wieman Auction Facility at 44628 SD Hwy 44, Marion SD. 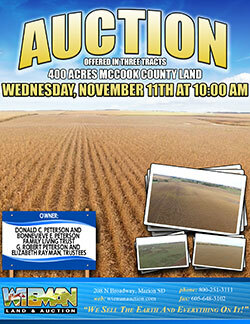 We will offer the following farm land at auction at the Wieman Auction Facility at 44628 SD Hwy 44 or from Marion SD, 1 south & ½ west. 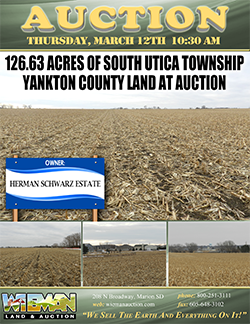 We will offer the following land at auction on the land located at 23640 464 Ave. or 1 ¼ mile south of Jct Hwy 34 & 461st Ave. or from Wentworth SD, 1 south, 1 west & 1 ¼ south. 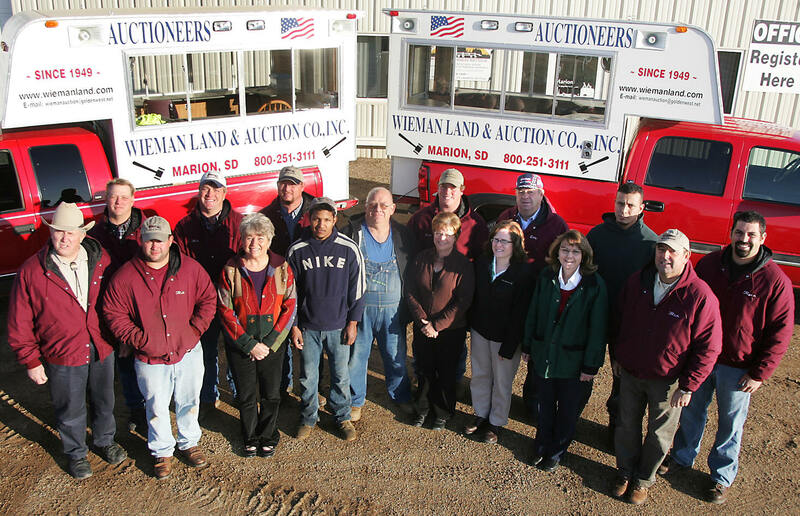 I will offer the following land for sale at public auction at the Wieman Auction Facility located 1-mile south and ½ mile west of Marion, SD. The East 5/8 of the NE � except the North 842� of the East 392.87� and except Lot A of D J Johnson�s First Add a subdivision of the NE � all in Section 21, 102-53 McCook County, SD. I will offer the following farm land at auction on the farm located from the SE Corner of Lennox SD, go 4 miles to the Jct of Hwy 17 & 283rd Street. 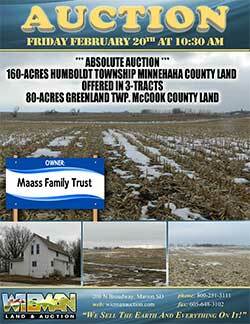 We will offer the following real estate at auction on the acreage located at 208 S. Ford Street or 2 blocks south of Hwy 38 on Ford Street (near intersection of Hwys 19 & 38) on the east edge of Humboldt SD. 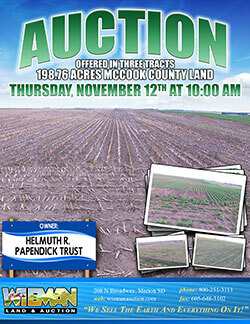 The following two tracts of land will be offered for sale at auction in the Wieman Auction Facility located 1-mile south and ½ mile west of Marion, SD. LEGAL: The SW � of Section 20, 98-53 Turner County, SD. 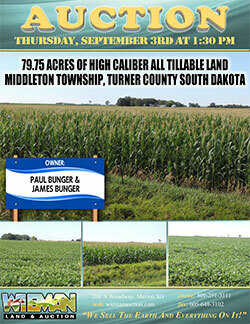 LEGAL: NE � of Section 25, 98-54 Turner County, SD. We will offer the following farm land at auction at the Wieman Auction Facility at 44628 SD Hwy 44 Marion SD or 1 South and ½ West of Marion SD. The land is located from Davis SD (Hwy 18 – 461 Oil Road) go 2 North on 461 Ave then 1 ½ East on 283 Street or at the Junction of 283 Street and 463 Ave; or from Chancellor SD, go 6 South on 461 Ave then 1 ½ East on 283 Street. 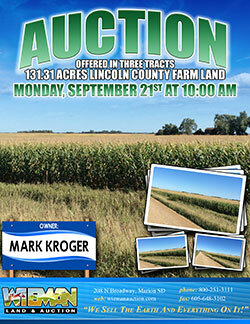 This auction to be held at the American Legion Hall – Main Street Davis SD. 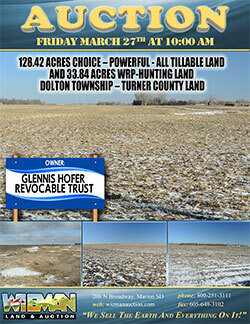 To be sold at the land site located ¾ Mile South on Oil Road (429 Ave) from the west edge of Emery SD (Cargill corner). 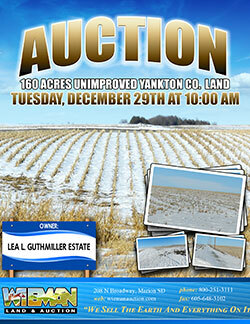 This auction will be held at the Wieman Auction Pavilion (inside – heated), 1 South, ½ West of Marion SD. In order to settle the estate, the following land will be offered for sale at public auction at Minervas Convention Center 1607 E. Hwy. 50 Yankton, SD. It is our privilege to offer 2-unique properties located in two tightly held townships along the Minnehaha and McCook County line. 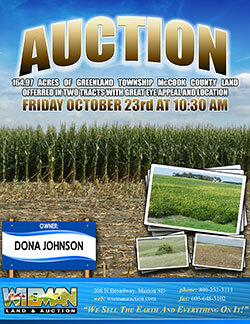 This auction provides opportunity to purchase an existing acreage site, tillable land and pasture. 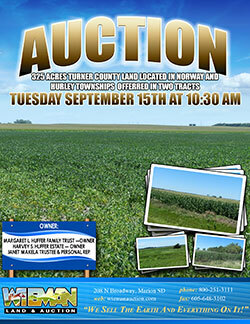 Acreage buyers, livestock producers and farmer/operators don’t miss out on this opportunity. 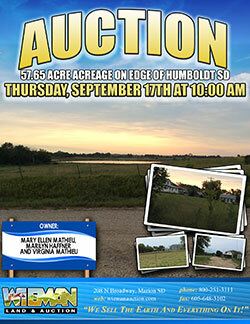 We will offer the following land for sale at ABSOLUTE AUCTION located in the Humboldt Community Center 201 S. Main St. Humboldt, SD. Approx. 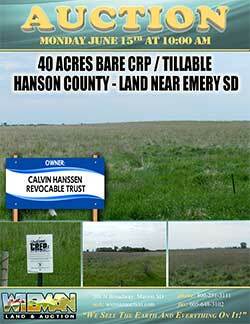 10-acres in the NE 1/4 of the NW 1/4 Section 17, 102-52 Minnehaha County, SD. The NW 1/4 except Tract 1 in Section 17, 102-52 Minnehaha County, SD. The E � of the NW � of Section 24, 102-53 McCook County, SD.